It’s been really hot lately. So hot that my usual getting-out-of-the-house activities are not an option. Going for a walk? No thank you. Playing in the park? Not unless I want heat stroke. Other (free) indoor activities, such as going to the grocery store or library, haven’t panned out so well, as I haven’t always felt up to the task of managing both kids in a public place, especially after a few choice tantrums (not thrown by me). So we’ve been a little cooped up, and everyone’s been increasingly stir-crazy. I’ve been experiencing the joys of a teething baby (four teeth at one time), missed the boat on sending my toddler to day camp (boy do I regret that indecision), and in general, am feeling the need for space in a big way. This means that when the kids are playing nicely on their own (which happens so infrequently that its occurrence makes me wonder if I’m not hallucinating), I don’t run so fast to see what they’re doing. I know that if they’re quiet, it very well may mean a mess to clean up later, but I’m just so happy for the respite that I hope for the best (even though I know that’s a bit of wishful thinking). This is a story of how reality squashed my wishful thinking. Last week, early into the Nine Days, I decided to self-clean my oven so I could make some milchig dinners in the oven for a change (I only have the stove-top at my disposal since our toaster oven finally gave out). I turned on the self-clean in the late afternoon, while the kids were still awake and playing relatively quietly in their room. The oven door automatically locks during the cleaning, which sure is a nice feature, and let me relax to some degree. I was checking Facebook doing this that or the other around the house when the smell of burning plastic wafted over to my nose. 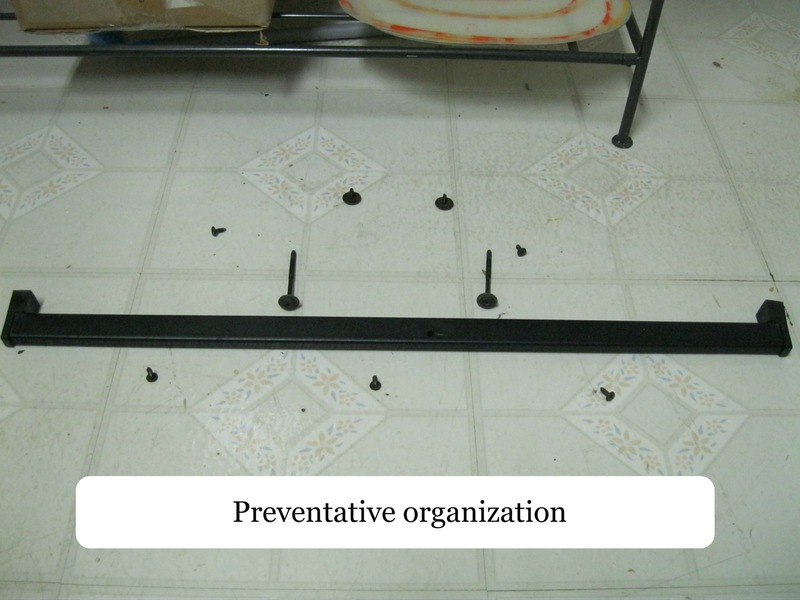 My first thought was that maybe the pots and pans stored in the drawer under the stove were getting too hot, so I opened the drawer and removed them. They were warm, but nowhere near warm enough for melting plastic. I sniffed each one (yes, I did) as I placed it on the floor, but that smell was not coming from any of them. So then I looked at the oven door and saw it. One of my super-skinny cutting boards. 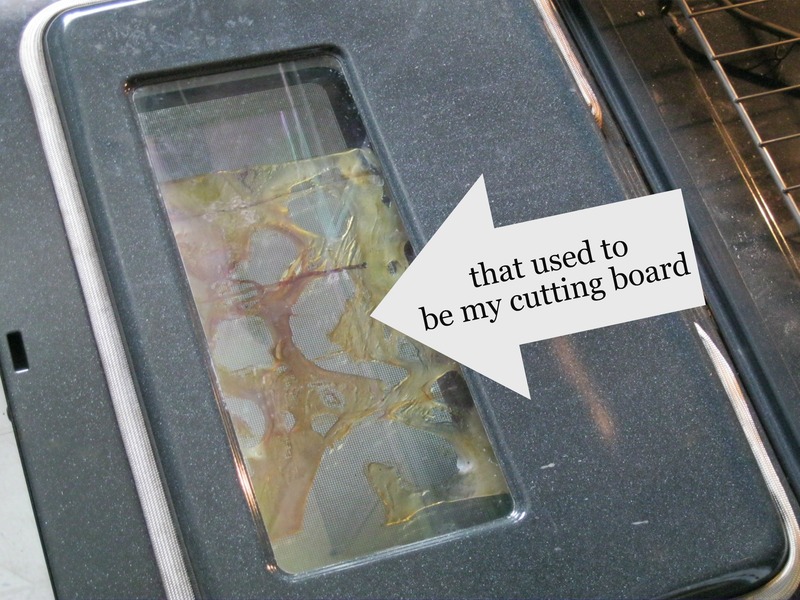 Well, what used to be one of my super-skinny cutting boards. Now it just looked like smoking, melting Swiss cheese, er, plastic (this picture was taken much later in the evening, FTR, since I couldn’t open the oven door for what seemed like hours). 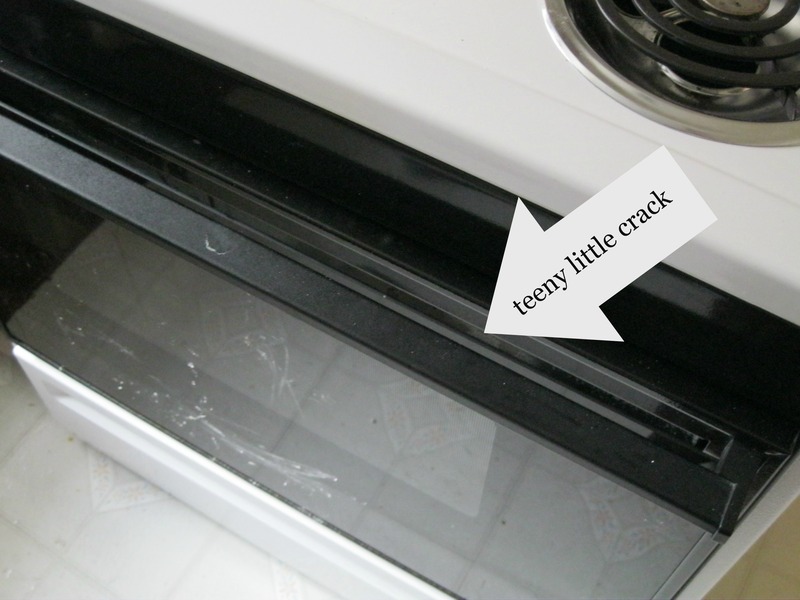 Did you know that on certain stoves, there’s a little teeny crack in the top of the oven door? It leads to a space between the outer glass and the inner, double pane. It’s for ventilation, apparently. I was unaware that this tiny yet hugely problematic space existed. 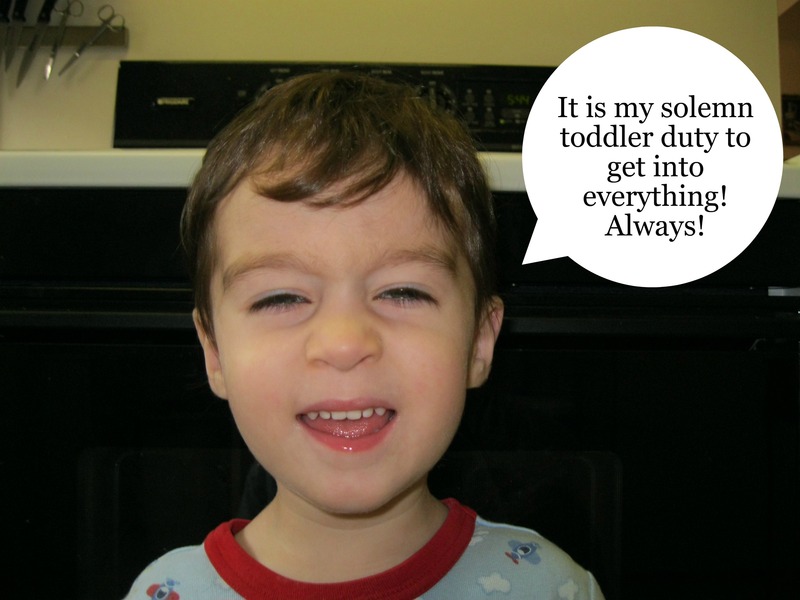 My toddler, with his unquenchable curiosity, had clearly discovered it. My reconstructed scenario went something like this: He had opened the dishwasher, pulled out the cutting board and inserted it into this enticing little oven door crevice. I don’t know when he did it. Sometime that day. And now said cutting board was quickly fusing to my oven door, and smoking up my kitchen. So, I turned off the self-clean. No baked ziti for us that night. 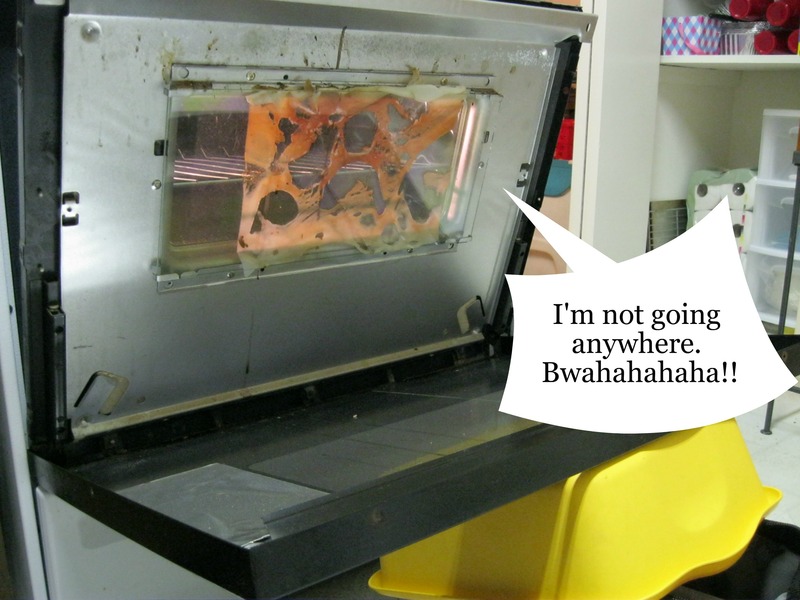 Later that evening, when the boys were safely asleep in their cribs, and the smell of plastic gone from my apartment, I took a look at the oven door. It was still mildly warm, and I thought that perhaps I could scrape the cutting board off the glass. 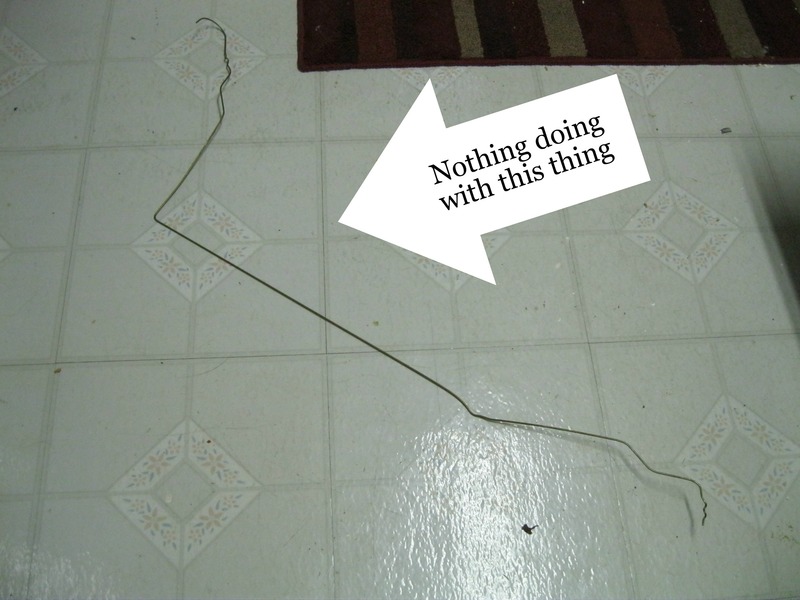 I found a wire hanger and bent it into a useful (I hoped) shape. After attempting to scrape around in there, I realized that I was probably just pushing more plastic down into the oven door than removing it, and I gave up on that idea. The next logical step, was, of course, to take the oven door completely apart. Right? ‘Cause that’s the most reasonable course of action. Also, my husband wasn’t home to talk any sense into me. I got out the big guns: my toolbox. Time to get handy. While I was removing the screws from the door, I did have the foresight to arrange them carefully in their respective order. Perhaps it wasn’t necessary, but I didn’t want to be stuck with a disassembled stove and no idea of what went where. Plus I liked having control over some part of this crazy stove situation. After the door front was removed, I assessed the damage. It was not pretty. There was no way I was going to be able to separate the plastic from the glass. It was baked neatly in between the two inner panes of glass. Despite my frustration, it was actually kind of impressive. 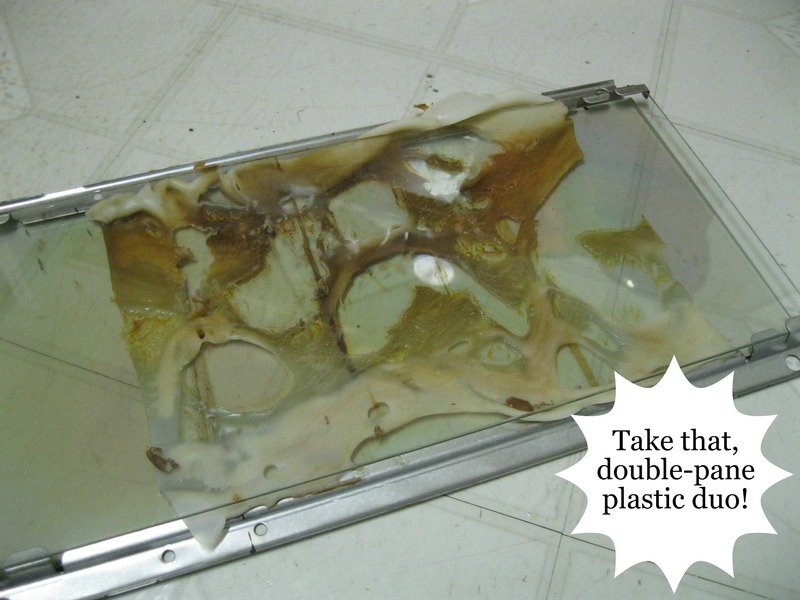 The most reasonable next step was removing the plastic-covered glass from my oven (right?). Ostensibly, this was so I could show it to the Home Depot guys to get a new one, but really, I think I was just having a little too much fun taking things apart (who, me?). And maybe I was hoping a little bit that if I just took out the offending plastic/glass combo, I could still make baked ziti the next day. I reassembled the oven door rather uneventfully, and was really hoping that I could use the oven soonish. However, when I asked the men at a nearby appliance store if I could use my oven without that part, they told me ominously of wasted heat, burnt little hands and shattering glass. Yikes. So, no baked ziti for us. Now I just need to order the part … until then, stove-top cooking it is! I’ll take any good stove-top recipes you have to offer. Also, we put up a gate to the kitchen. Best decision this summer. What’s the most unusual/inconvenient household damage you’ve experienced? I love how you arranged the little screws just so. Sounds like something I would forget to do, or do and then sneeze and blow them all into unputtable-together again-ness. I have found your blog while searching for other Jewish bloggers and joined your FB page. This sounds like something that would happen in our house and Yes , I am the “handyman” over here too. How about I spent this past Friday, mere hrs before Shabbat, caulking my bathroom tile rim (4ft of it) that my cleaning girl so skillfully knocked out with her sponge, so we can all take shower before Shabbat, without sending a leak down the wall through the open crevices. Did I mention My kids enjoyed poking into it, hence the 4ft of it in the end. Hi Malka, thanks for commenting! Glad you found my blog (and joined my FB page – how nice!). I “liked” your FB page as well. Your art is lovely and whimsical. Sorry about your caulking job, and the Desitin! You just *know* that something is going on with all that quiet. Wow, that must’ve been an interesting scene to behold. Glad he was okay (Eli, that is). Yikes! Super yikes! We have our IKEA bookshelves screwed into studs in the wall. No falling over for us (especially with the little kiddies around)! Ha ha ha ha!!! I love the “handy housewife” picture! This is such a great post! I love the photos and commentary within the writing. And I’m so sorry about the cutting board. Isn’t that the worst?! I admire you for taking the oven apart and trying to fix it yourself. I would have waited for my husband. Thanks, Leah. It’s a pretty ludicrous situation. I wanted new cutting boards anyways, though! Also, my mom was super handy, so it’s in my genes (and it’s definitely not in my husband’s!). Wow. I’m both impressed by LM’s creative helping skills and by your disassembling ones. And while I’m sorry about your baked ziti and your oven door, that story is awesome, and it will probably get funnier the farther in the past it gets. Oh, and great picture captions! Thanks Penina, I had fun with the pictures. Knowing that I was going to blog about it definitely took the edge off. Yay for blogging! Oh, boy, what an adventure. Please send the post to KCC! I’m glad I have two mini-ovens, since there’s no need to kasher them. It is my dream someday to have two ovens. I will send the post over with pleasure. You post had me howling into the screen. Loved it. Found you on She Writes. I’m a fan already! Rivki a baby gate must have been a good purchase indeed! It was one of the first things that came to mind for us as we are getting ready to baby proof our apt. Glad that everyone came out unscathed in the process, and yasher koach for being so handy. Did you do anything else for baby proofing? Extremely useful! A must-have! Having one which swings open was also crucial, in our estimation. As far as baby-proofing, we covered outlets, put dangerous stuff (scissors, knives, etc.) out of reach, ditto breakable stuff. Basically, everything got moved up. This blog entry is a good two and a half years old at this point, but whatever, haha! My crazy household story actually happened at my mother-in-law’s a few summers ago, back when my husband and I were engaged. We were both off from work that day and we were helping with some stuff around her house while she was at work. One of her cats decided to bring in a LIVE baby rabbit! I stuck Sophie (cat) in the spare room while Justin herded Peter Cottontail into the bathroom and shut the door so the poor little guy could calm enough enough to be released safely. With the bunny out of harm’s way, I’d go get Sophie and that would be that. Except that’s not what happened! The carpet in that room was really old and coming loose at the corners. When Sophie scratched at it, she had pulled it up in such a way that it had covered the door and blocked it! Justin decided he would get a ladder, climb in through the window, fix the carpet, and open the door. Once he was on the roof he discovered that the windows were locked! After that part of the saga, I came up with the ridiculously simple idea of trying to shove a yardstick under the door to flatten the carpet. My yardstick idea worked, and we got Sophie out of there a few hours after the whole thing began! Oh my gosh! What a story!! Hahaha, thank you for sharing it. I’m cracking up over here. Holy wow!! That is so crazy!! I have twin boys who just turned 5 and this is SO something they would do. Great story – and I certainly hope everything was resolved :-) Following from SITS today. I know, right? It was absolutely nuts! I’m sure twins can get into an impressive amount of mischief! Happy birthday to your boys, and thanks for stopping by! Haha, children are such great destructors, aren’t they? aren’t kids great for finding all the ways to destroy everything. LOL Dino has broken fans, doors, toys, thankfully nothing too expensive…YET…sighs. Haha, so true. I hope that you continue to only have small things destroyed. :) Thanks for taking the time to comment! This was hilarious! The perfect morning pick me up :) Can’t wait to read more–nice meeting you through SITS! I’m not laughing at you, I’m just laughing in your general direction. Oh, who am I kidding! I’m totally laughing at you! This is hysterical; hopefully for you too, three years later!! It was funny even at the time, just because it was so utterly ridiculous! I am always chasing them out of the kitchen, you’ve solidified my resolve. seriously, the damage they can do! That’s CRAZY! Your last part reminds me of my friends whose (presumably) normal oven DID burn their little babies hands.. he was cruising at about 7 months and somehow the outside was so hot and his little hands were just stuck to it.. :( Wise woman to wait on that one! This reminds me of the time I thought I could take some baseboards off the wall while my husband was out of town and I ended up busting huge holes in the dry wall… that are still there. Yep. Oh, that poor baby! I’m a little paranoid about my oven and my little people. Haha about the baseboards. I can completely understand that scenario. Sounds like something I would do! I would be bawling… I can not handle that level of inconvenience and frustration. It was definitely one of those “if you don’t laugh you’ll cry” moments. Totally!